There's a long tradition of horror films pitting naïve city slickers against stereotypical backwoods psychopaths. I suppose that's because hillbillies are one of the few groups it's still acceptable to pick on in these politically correct times. 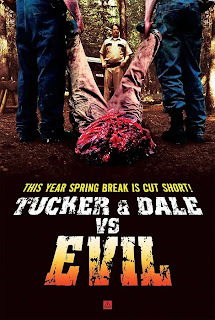 Finally, with TUCKER & DALE VS. 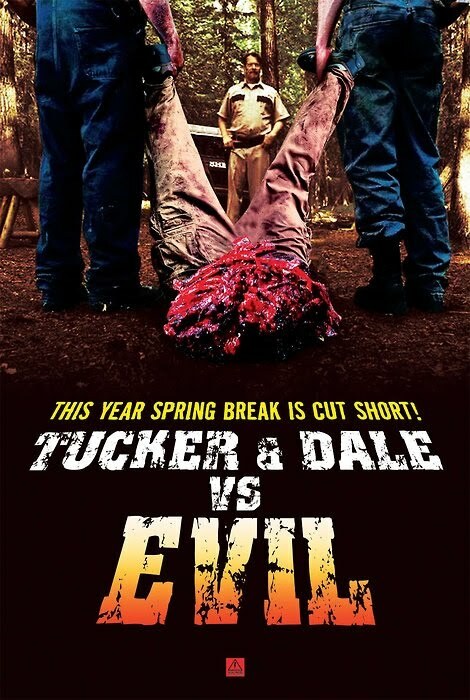 EVIL, we get a horror comedy that shows rednecks in a positive light. Tucker (Alan Tudyk) and Dale (Tyler Labine) have just realized their dream of buying a vacation cabin in the woods where they can go fishing, drink a few beers, and just generally hang out and be guys. The place is a fixer-upper, though, and the previous occupants must have had the same decorator as the family in THE TEXAS CHAIN SAW MASSACRE. So the boys head out to do some work, bringing along an assortment of chain saws, axes, and even a wood chipper. Also out for a weekend in the great outdoors are a group of obnoxious college kids. Tucker is smitten by one of the girls, Allison (Katrina Bowden), but he doesn't have much in the way of game. His awkward advances (not to mention the giant scythe he's carrying) only serve to unnerve the young urbanites. Later that night our good ol' boys are out fishing when they see the other campers out skinny dipping. When Allison bumps her head and falls in the water, Tucker jumps in to save the girl without hesitation. Her friends, seeing this through the filter of their own prejudices, assume that Tucker & Dale are trying to abduct Allison. Further misunderstandings cause things to escalate into a full blown power tool massacre. Tucker & Dale are wonderful characters to build a movie around; a couple of decent and likeable guys, smarter than they look, who are genuinely horrified and upset by the carnage taking place around them. There's not much here that would qualify as scary by anyone's standards, but this is a great premise and what the screenplay by director Eli Craig and co-writer Morgan Jurgenson lacks in scares it makes up for in laughs. Not everything in the movie works, and it's not in the same league as DEAD/ALIVE or RETURN OF THE LIVING DEAD, but TUCKER & DALE VS. EVIL is still good gory fun. One word of advice, though: do not watch the trailer. It probably would make you want to see the movie, but it also gives away too many of the film's biggest laughs. You'll appreciate it more if you don't know what's coming. 3 out of 4 stars.